Bill Steinkraus and Snowbound at the 1968 Olympic Games in Mexico City, where they won gold for the USA. Legendary US showjumper Bill Steinkraus has died at the age of 92. The five-time Olympian passed on November 29, surrounded by his family and loved ones. William “Bill” Steinkraus was the USA’s first showjmping individual medalist, rode at the Olympics five times, between 1952 and 1972. He won gold on Snowbound at the 1968 Mexico City Games, and team silver at Munich in 1972 on Main Spring, at Rome in 1960 on Riviera Wonder and team bronze in Helsinki in 1952 riding Hollandia. From left, George Morris, Bill Steinkraus and Frank Chapot in their heyday. All three were honored in 2012 at US Equestrian headquarters in Gladstone, New Jersey. His 1960 Olympic teammate George Morris told Practical Horseman: “He was a renaissance man. He knew something about everything.” He said Steinkraus was “impeccably mannered, impeccably dressed,” and meticulous not only in his horsemanship, but in everything he did. “I learned so many things from Billy. He was a great riding teacher on a high level,” Morris told the magazine. Steinkraus boasted one of the most decorated equestrian careers in US history. He was born in Ohio but grew up in Darien, Connecticut. His family was not involved with horses, but Steinkraus began riding at the age of ten with Amud Thompson. He was a member of the Ox Ridge Hunt Club. He became more involved with the sport when he began training under esteemed horsemen Gordon Wright and Morton W. “Cappy” Smith. In 1941, Steinkraus made history by winning the coveted ASPCA Maclay National Championship trophy at the National Horse Show in addition to winning the Good Hands Finals in Saddle Seat Equitation. Steinkraus attended Yale University in New Haven, Connecticut before enlisting in the Army’s cavalry branch. From 1943 to 1945, he served as a member of the 124th Cavalry Regiment in China-India-Burma during World War II. Bill Steinkraus and Snowbound on their way to winning gold at the 1968 Mexico City Olympic Games. He was the first US rider to win an individual showjumping medal. Upon graduating from Yale in 1949, Steinkraus returned to focusing his efforts on his show jumping career. At his 1952 Olympic Games debut in Helsinki, Steinkraus helped secure the bronze medal for Team Show Jumping. 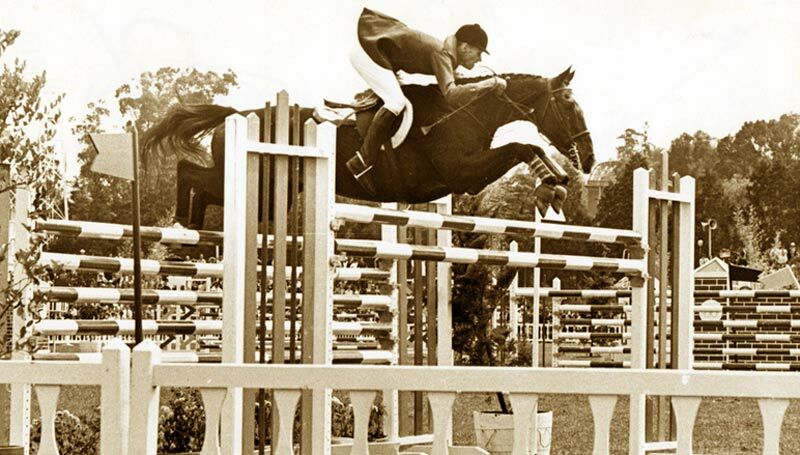 Steinkraus retired from showing internationally in 1972, but remained heavily involved in the sport as a judge, TV commentator, clinician, coach, and author. For 17 years, he was the chef d’equipe of the US Showjumping Team. He was a director at the American Horse Shows Association (now USEF) for more than 40 years and judged at Olympic Games, World Championships, World Cup Finals and Pan American Games. He was president of the FEI World Cup Committee for 10 years. Steinkraus was also a noted author, penning Riding And Jumping in 1961, The Horse In Sport in 1987, Reflections On Riding And Jumping: Winning Technique For Serious Riders in 1991, and Great Horses Of The United States Equestrian Team in 1997. A founding member of the USET, Steinkraus served as well-respected president and chairman of the organization for two decades, serving as Chairman Emeritus for the past 25 years. Steinkraus was the first equestrian to be inducted into the Fairfield County Sports Hall of Fame in 2016, joining notable athletes such as baseball player, Jackie Robinson and basketball player, Calvin Murphy. A gifted violinist, Steinkraus enjoyed classical music and played in the Connecticut Symphony. Steinkraus’s family hosted a private service and asked for any donations in his memory to be made to United States Equestrian Team Foundation, which is holding a memorial service later in the year. Bill Steinkraus and Fleet Apple. William C Steinkraus (12 October, 1925 – 29 November, 2017) is survived by sons Eric, Phillip, and Edward, and three grandchildren.